Jaime Tijerina at Lark Community Center on Tuesday, Nov. 6, 2018, in McAllen. Texas Attorney General Ken Paxton wasn’t the only candidate under indictment to win election Tuesday. Closer to home, Democrat Rodolfo “Rudy” Delgado, a longtime fixture at the Hidalgo County Courthouse, was narrowly elected to the Place 4 seat on the 13th Court of Appeals. 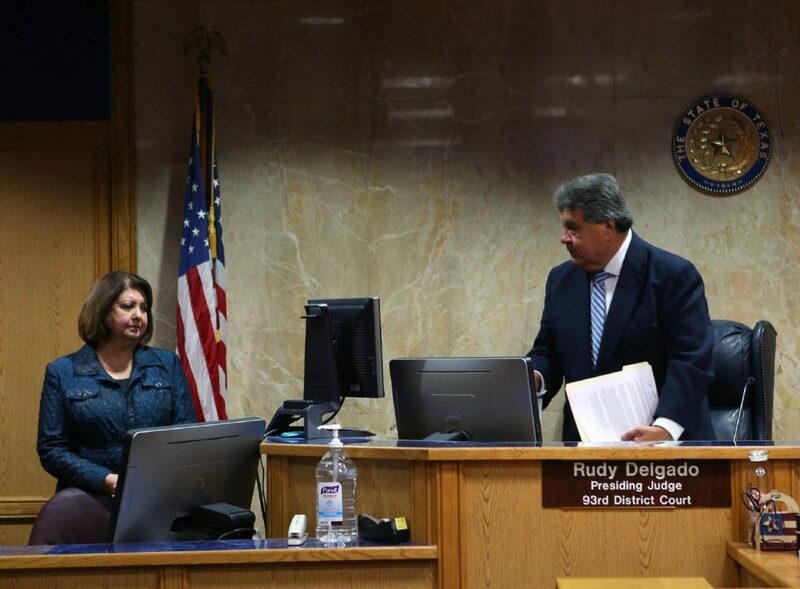 Delgado has been under federal indictment since February for multiple counts of bribery and conspiracy, having allegedly accepted bribes from a local attorney in exchange for favorable rulings from the bench. That attorney, Noe Perez, plead guilty to one count of conspiracy to commit bribery concerning programs receiving federal funds in May and is scheduled to be sentenced in early December. From January 2008 to November 2016, Perez “knowingly conspired with Judge Rodolfo ‘Rudy’ Delgado, the Texas District Judge for the 93rd District Court of Texas,” allegedly paying him cash bribes ranging from $250 to $350 on at least 20 occasions, according to Perez’s federal indictment. Despite Delgado’s April resignation from the bench, his disappearance from the campaign trail and substantial coverage of his federal charges by local media outlets, Delgado still managed to win 50.35 percent of the vote, a 3,220 vote victory over Republican Jaime Tijerina. Attempts to reach Delgado Wednesday through his campaign treasurer, his wife Diana Delgado, were unsuccessful. Tijerina attributed his narrow loss to the prevalence of straight ticket voting in solidly blue Hidalgo and Cameron counties. Unlike district court judgeships that are determined by voters in a single county, voters in 20 counties stretching from the Coastal Bend to South Texas had the opportunity to cast a ballot in the 13th Court of Appeals races. Tijerina, who held campaign events in all 20 counties, only lost Hidalgo, Cameron, Willacy and Kleberg counties, carrying the remaining 16 counties by large margins of 50 to 70 percent of the votes. But, those losses were significant given that the number of votes cast in Hidalgo and Cameron alone accounted for 49.89 percent of the total number of votes cast in all 20 counties, according to data from the Texas Secretary of State’s office. 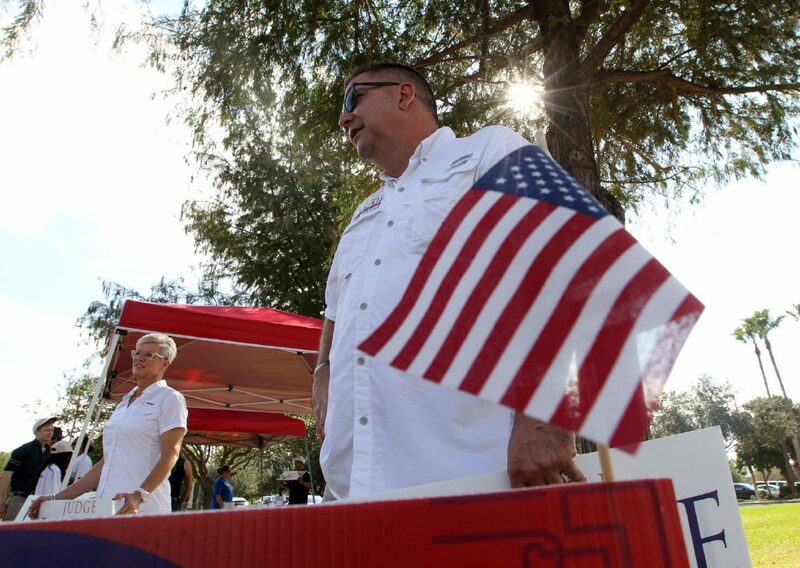 “I thought it would be a win, and then the numbers came in from Hidalgo and Cameron counties, and the Election Day straight ticket (votes) killed me,” Tijerina said Wednesday, calling straight-ticket voting “the number one factor” that contributed to his loss. Delgado won 63.17 percent of the vote in Hidalgo County, equivalent to 93,452 votes, and 60.73 percent of the vote in Cameron County, resulting in 45,864 votes in his favor. Approximately 84,200 people in Hidalgo County voted straight-ticket for the Democratic Party, according to the county’s elections department. Twenty-six percent of those votes were cast Nov. 6. In Cameron County, approximately 30,000 people voted straight ticket for the Democratic Party, a third of which were cast on Election Day, according to the county’s elections department. This was the last midterm election in which the straight-ticket option was available; it will be eliminated from ballots come 2020. Losing Hidalgo and Cameron counties negated Tijerina’s victory in Nueces County, where he received 50.35 percent of the vote, making him the only of the four Republican candidates vying for spots on the 13th Court of Appeals to win that county. Following Delgado’s resignation, Gov. Greg Abbott appointed Tijerina to fill the vacancy on the 93rd District Court through the end of 2018. There’s a chance the governor could again appoint Tijerina to fill the vacancy on the 13th Court of Appeals that will open once current Place 6 Justice Dori Contreras takes the oath of office for the chief justice spot, a position she won Tuesday. A vacancy could also open if Delgado decides not to take the oath of office or if he is convicted of the federal felony charges against him. Per Texas law, someone is not disqualified from holding public office until they’ve been convicted of a felony and exhausted the appeals process. “I never intended to look at Plan B, but that is certainly something that is one of those million possibilities,” Tijerina said. This story has been updated to reflect that Attorney General Ken Paxton was indicted out of Collin County, Texas.